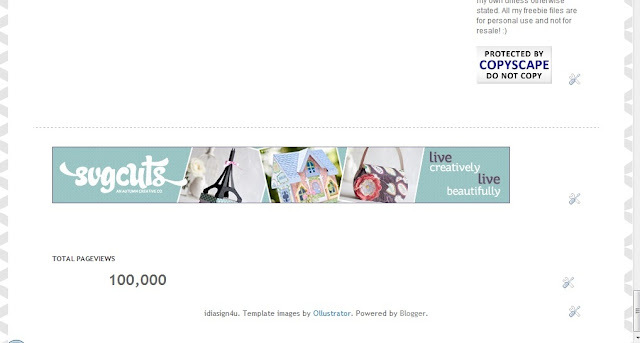 I Love Doing All Things Crafty: Happy Birthday Cake Shaped Card and 100,000 Page Views! Happy Birthday Cake Shaped Card and 100,000 Page Views! So anyways back to the card... This weekend we have 5 Birthdays to go to or celebrate!!! Yes, 5! Good thing I had recently made up a few Birthday cards for my stash! Here is another of Miss Kate Cuttables daily freebie files. You can never have enough birthday cards and I thought this image was perfect to create one out of. To do that, click here for how I did this with another one of my cards. This is what the card looks like when its opened up. I used a stamp from Studio G. Paper all came from my scrap collection, all cut with the Cameo. Thanks for stopping by today, so happy you did! If you haven't yet make sure you check out her Miss Kate's website! woohoo! congrats on 100,000 views! Hello! I came across your blog via the Meet & Greet Blog Hop. I follow you through GFC. Please visit my blog and follow me back. If you enjoy my post, please click "Like" or leave a message. I appreciate the support. Wonderful card and good luck with all those birthdays. Congrats on all those page views. Saw this over on DLArts linky party and had to come over to tell you how much I love this! This is so darn cute...love that smiley cake!